to her "My Favorite Room" series? guest post on your lovely blog! My name is Mary Alice from Chateau Chic. 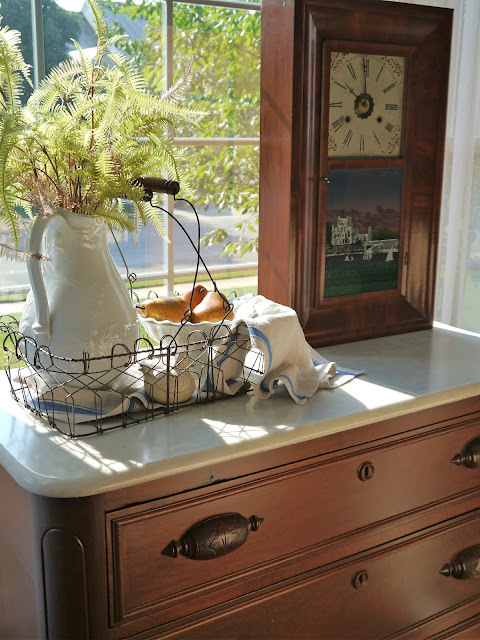 of my favorite decorating and family pieces. This is my fall mantel in the living room. the pumpkins, orange foliage, and candles? I went with a pear theme this year...very simple! If you look closely, you'll see another one under the small cloche. The pear theme continues on this marble top family piece. coffee table adds a lot of warmth to the room. A European bread tray corrals three favorite iron urns. that is updated with a new seat cover. adds a subtle fall touch in an out-of-the-way spot. and followers into my home. Thank you, Mary Alice. Folks if you have not visited Chateau Chic, please do. 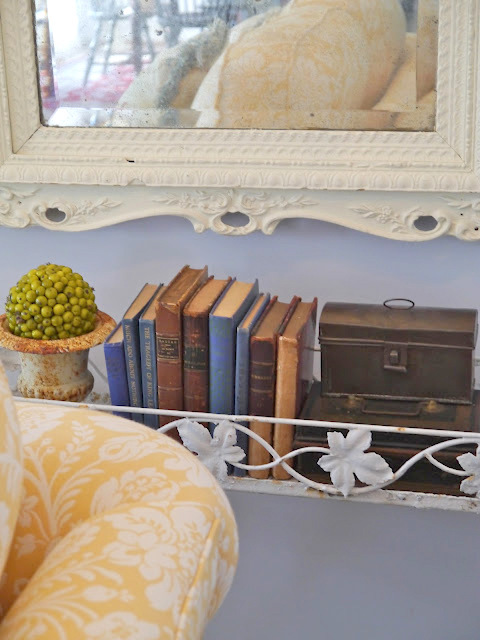 She has created a wonderful cozy home filled with vintage treasures. Check out her etsy shop, too. ooo, very pretty. Love the pear theme! I like how it's different from everything. Goes well with Mary Alice's room! Kim, This is such a pretty room! I love all the unique accessories. Love all the soft pretty colors you used. So creative! Mary Alice I can see why this is your favorite room! 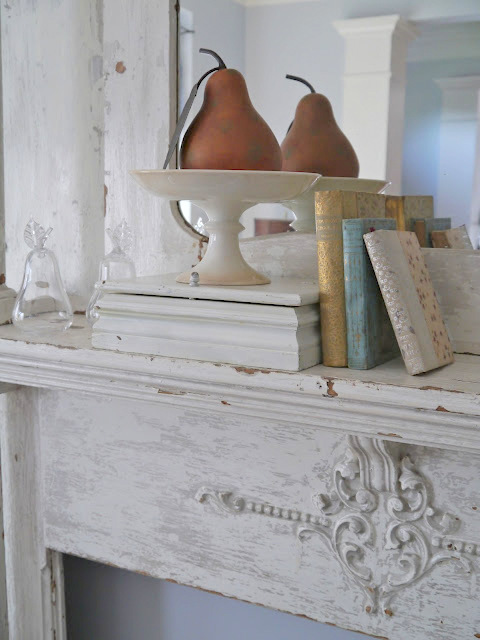 Love everything about it, especially that GORGEOUS vintage mantel!! Great feature Kim! Have a great weekend! Oh Mary Alice .... this is just lovely! I love the loveseats ... where did you find them? Thank you both for sharing this adorable room! Enjoy this beautiful day and have a wonderful weekend. Jumping over to your site right after I post! very pretty! I love the diversity of all the spaces you are showing in this series. Thanks ladies for sharing this luvly room. 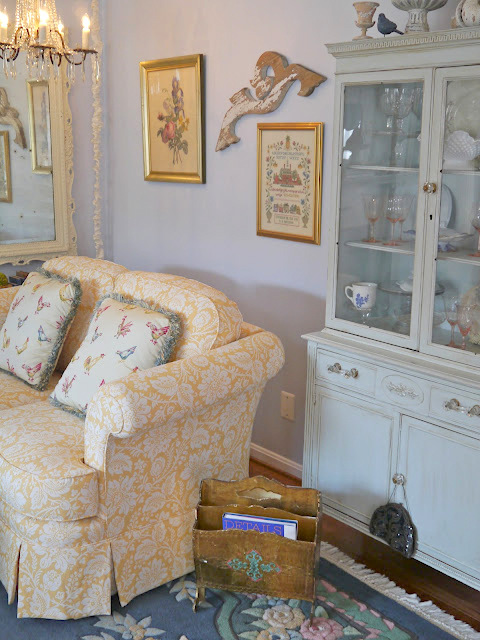 Mary Alice, I can see why it is your favourite room :-) It is filled with beautiful family pieces. Thanks Kim for this wonderful series. What a wonderful room! Thank you Kim for featuring Mary Alice. This is a great series! 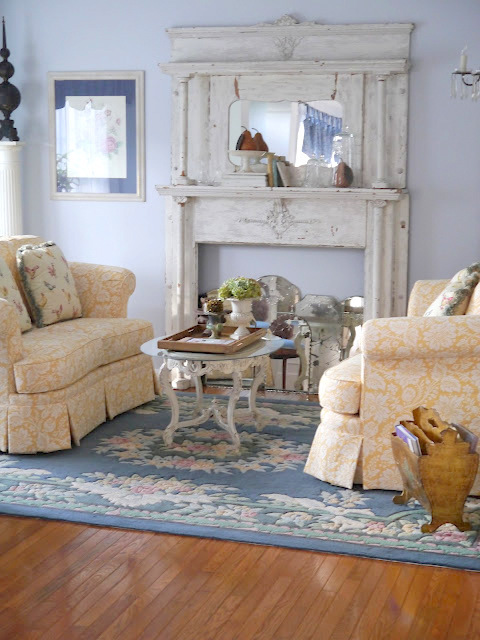 Mary Alice, your living room is so lovely! 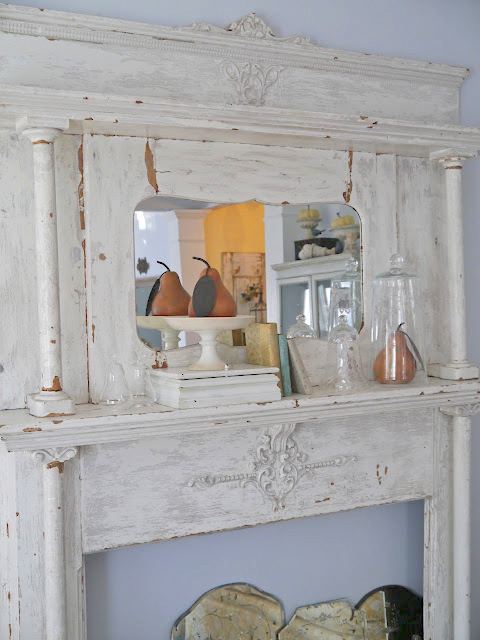 My favorite part is the vintage mantel and I love your simple pear theme. Also, I absolutely love your old clock and especially the fact that it's a special family heirloom! I love the mirrors :) very pretty. Alice's room looks so beautiful! I'm in love with that antique mantel! It is the prettiest thing in the room. 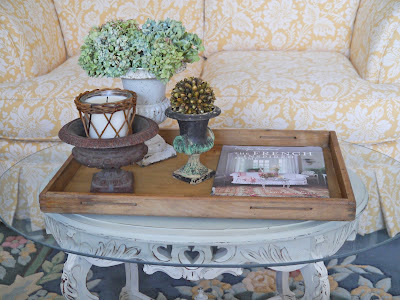 I also love her coffee table and little grey side table. So french and charming. 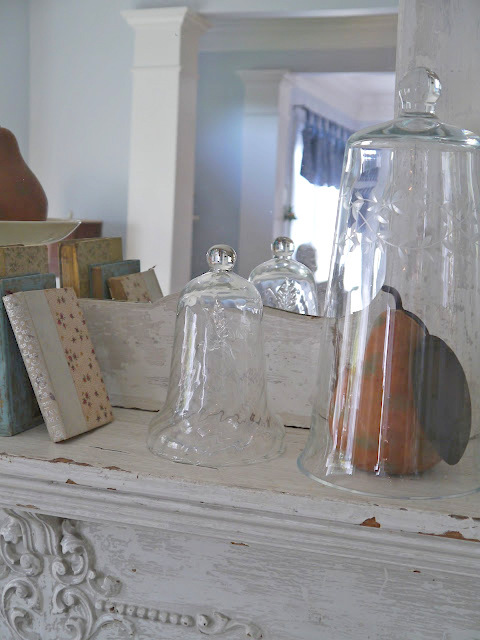 Alice always has the prettiest vintage items on display in her home. Thanks for sharing her favorite today! I love those couches/loveseats and the fabric! Info.? This room is so lovely, Mary Alice! I love the colors and lightness of it, and also the warmth. Your family pieces are so beautiful, and so prettily displayed. Thank you (and Kim!) for the opportunity to see your lovely space. What a gorgeous room! That mantel is absolutely fabulous! Nice post. Lovely done room. Love your gorgeous room Mary Alice. Love that fireplace. This room is wonderful! Those vintage and shabby chic touches... Fantastic. Besos and congratulations for this section, you are making great choices. Beautiful room. 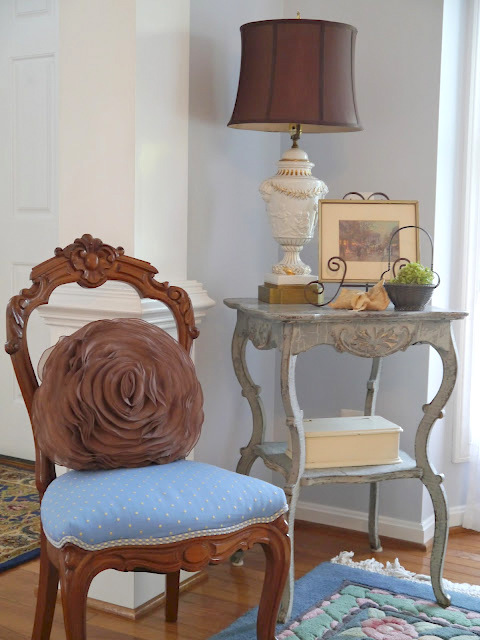 I love that little French side table! Your valances are charming. Did you make them? It is always a treat to visit Mary Alice's beautiful home! Thank you for sharing! 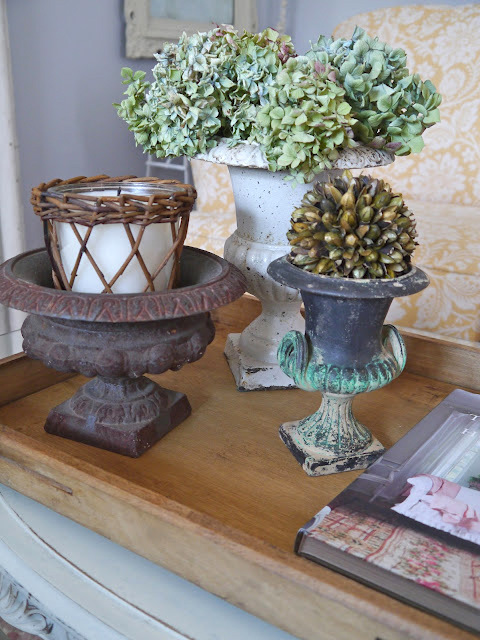 Love the simple fall theme of pears Mary Alice chose - I used pears on my mantel too this year! 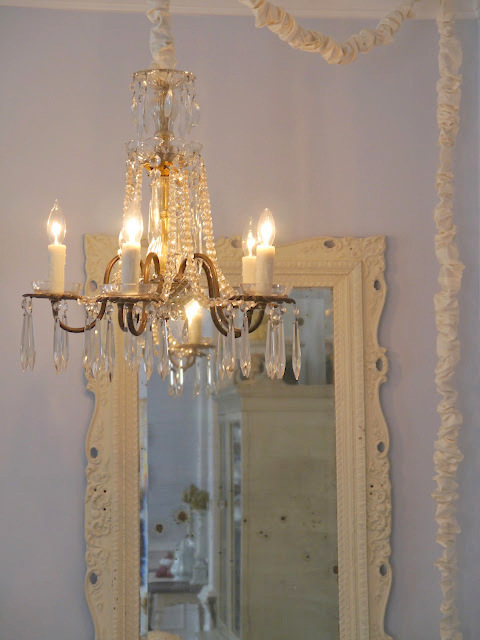 I am in love with the mirror collection in the "fireplace"!! Kim and Mary Alice, thank you for sharing this lovely room with us. 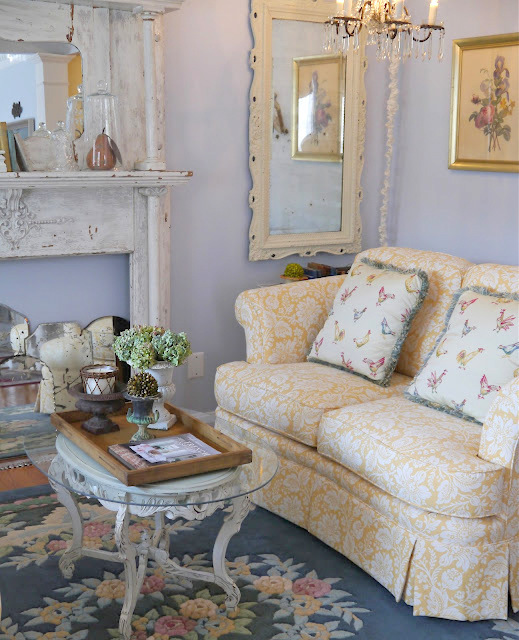 Mary Alice, this is such a pretty room - charming, inviting and the soft colors are refreshing. No doubt that mantel has everything going for it, love it. And the mirrors in the bottom, love those too. What a lovely room. It looks so warm and inviting, and I love the subtle touches of fall. The marble topped family piece is really special! Fun series, Kim! 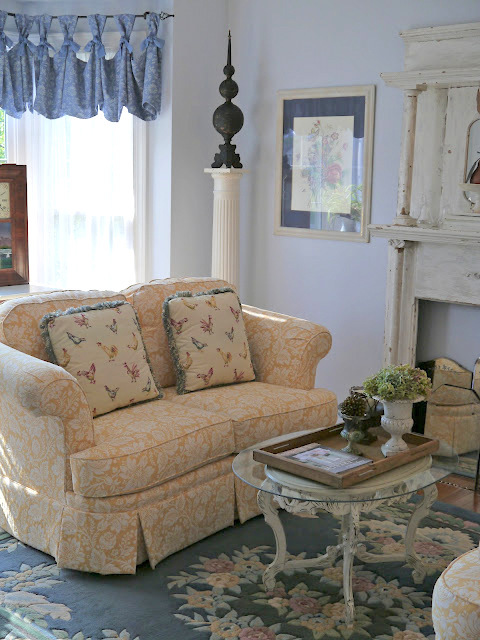 Every corner of Mary Alice's home is arranged just beautifully and her living room is no exception. I love her mantel and gorgeous sofas!